Mountain Resort Cabin Rentals - Its 5 O'clock Somewhere- Ellijay, GA - Ellijay Vacation Rentals. 4 bedrooms, 3 full bathrooms. Sleeps 10 Guests. Welcome to It`s 5 O`clock Somewhere Sit, rock and enjoy 5 O`Clock is situated at the end of a semi private road in the Coosawattee River Resort. Kitchen Dining Room seats six The living area is open with a comfortable sofa, love seat ,TV and gas fireplace. Another view of the living room area. Stairs leading to the 2nd Bedroom and Loft The master bedroom is on the main floor with Queen bed Master Bedroom with Dresser & Flat Screen TV A full bath with double sinks on the main floor. There is a Full Sized Bed, dresser upstairs in the 2nd bedroom. Flat Screen TV in the 2nd bedroom Full private Bathroom in the 2nd bedroom upstairs Walk in Shower The pool table in the loft. The pool table in the loft. Dart board in the loft. Full Size Bed in the Third Bed room. Downstairs. Bunk Beds in the Third Bedroom Third Bedroom Flat Screen TV in the Third Bedroom Dresser in the Third Bedroom The 3rd full bath is downstairs and adjacent to the Third Bedroom The back deck is accessed by double doors from the dining room with rockers and overlooks a private back yard. It's 5 O'clock Somewhere is a cozy 4 bedrooms, 3 bath cabin with a sleeping loft. This cabin is nestled at the end of a private road in the Coosawattee River Resort. The living room has a sofa and love seat with a gas fireplace, TV with DirecTV, DVD and VCR. The kitchen is fully stocked and is open to the dining area which will seat 6 at the table as well as 3 on three bar stools at the kitchen bar. There is a private deck off of the dining area with rocking chairs overlooking the back yard with a fire pit. The master bedroom is on the main floor with a Queen sized bed, dresser and TV with DirecTV. The bathroom is on the main floor with shower/tub combo and double sinks. Downstairs is a 2nd bedroom with a set of bunk beds and a full sized bed with a dresser and TV. A private full bathroom is adjacent to the 2nd bedroom. The 3rd bedroom is also upstairs with a Full Sized Bed with a Flat Screen TV, DirecTV and full private bath. The 4th Bedroom is downstairs with a King Size Bed with a Flat Screen TV and Dresser. There's also a sitting room with 2 love couches and coffee table. The back yard has a fire pit and chairs, and a charcoal BBQ grill. 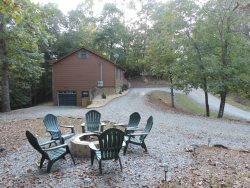 * Fully Stocked Kitchen * Microwave * Refrigerator * Oven * Toaster * Blender * Dish Washer * Dishes w/Utensils * Cooking Utensils * Pots and Pans * Washer / Dryer * Air Conditioning / Heat * Private Back Deck * 2 Soft Sofas * TV in 4 Rooms * Gas Fireplace * Linens Provided * Fire Pit * DirecTV * DVD/VCR * BBQ Charcoal Grill * Fire Pit * Private Wooded Lot * Pool Table * Phone (Local Calls Only) * Hot Tub. RESORT FEE:This cabin is located inside The Coosawattee River Resort and requires a $39.00 Resort/Amenity fee for your entire party. This pays for your access into the gated community of Coosawattee River Resort Cabins which includes all 5 parks, Picnic Area with Charcoal BBQ Grills, fishing pond (No License required) Fenced in Doggy park area, and petting barn only. There is one (1) amenities card provided by the owner with 7 punches for your visit. One punch on the card is good for 4 guest for the entire day. Two punches per day (8 guests) ONLY no matter how many cards you have. If the amenity card is lost or not left at the cabin upon your departure, there will be a $85.00 charge to replace it. GUESTS MAKING A RESERVATION MUST BE AT LEAST 28 YEARS OLD. BY SUBMITTING THEIR RESERVATION THEY ARE CONFIRMING THAT THEY ARE 28 YEARS OLD OR OLDER. NO LARGE GROUPS UNDER 28 YEARS OLD. MAXIMUM OF 6 GUEST WHO ARE UNDER 28 YEARS OLD IN ANY CABIN. Guest acknowledges and understands that check-in time is not earlier than 4:00 PM, and check-out time is no later than 11:00 AM on the dates agreed upon. Guest agrees that an unapproved late check-out or early check-in will be assessed an amount equal to one-half of the nightly rental fee. Housekeeping needs the time between 11:00 AM and 4:00 PM to prepare for your arrival.No Check-In or Check-Out allowed on Thanksgiving Day, Christmas Day or New Year's Day. A prepayment of $250.00 of the rental fee, by valid credit card, will secure your reservation with the remaining balance due 21 days before arrival. The same credit card will be used unless advised otherwise. Directions and (Gate pass for Coosawattee Only) will be sent via e-mail 1 week before you check in. If it is within the 21 day window, you will need to pay the total amount due. •Reservations canceled 22 to 29 days of arrival, a $250.00 cancelation fee. •For reservations canceled 21 days (or less) prior to date of arrival, the guest is responsible for the amount of the booking and your card will be charged in full.